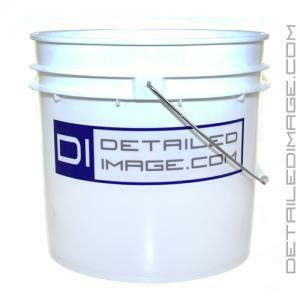 The DI Accessories 3.5 Gallon Bucket is a medium size bucket that is very durable, making it the perfect bucket for any detailer. It is made of high-density polyethylene, so it will last through years and many washes. The strong metal handle with plastic grip allows for easy maneuverability and this bucket features a stylish Detailed Image sticker on the side. Many detailers are now using the 3.5 gallon size bucket because it conserves more water, is easier to move around and easier to reach a Grit Guard at the bottom compared to traditional 5 gallon buckets. The Grit Guard Insert, Gamma Seal Bucket Lid, Bucket Lid, and the Bucket Dolly are just some of the great accessories that work seamlessly with this bucket. Show off your Detailed Image pride and share with everyone where you pick up your detailing products with the DI Accessories 3.5 Gallon Bucket! I have a gamma seal on and soon will add to my one bucket, turning it into a dual bucket system, for wheels and pad cleaner soaking bucket. Great size and colors, won't get confused with wash system. I use this for wheels alongside my normal 2-bucket wash method. Saves me from having to get any of my mitts extra dirty.